Lucca is an important city for art and traditional culture presenting a vital historic centre of extraordinary value. It´s famous for its narrow and medieval streets, churches, towers and intact walls. Lucca offers markets, festivals and exhibitions throughout the year and all facilities that you would expect from a small city. Lucca gave birth to great musician Giacomo Puccini. Visiting Lucca is an authentic experience: not only Lucca's fascinating town centre is worth a visit, its surroundings offer relaxing journeys, natural and historic locations waiting to be discovered. Easily reachable from Florence and Pisa, Lucca is close to Viareggio and the nearby beaches, as well as the countryside for picturesque landscapes. From April to June is the ideal time to visit Lucca. However Lucca is quite pleasant in fall. In September the historic centre of Lucca is lit during the festival called Luminaria di Santa Croce. If you arrive by plane the nearest airports are Florence Amerigo Vespucci and Pisa Galileo Galilei. There exist frequent connections to Luca both by train or by bus. 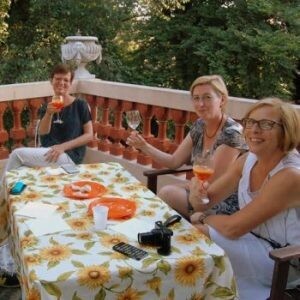 Studiainitalia can organize a transfer to Lucca for you. For further information on things to see and do during your stay in Lucca we recommend to have a look at the Lonely Planet Guide to Lucca.